This publication presents a tabulation of the temperature and associated data of subsurface rocks and two maps showing the location of wells for which temperature information is available in the files of the Oil and Gas Conservation Commission. Most of this information consists of the bottom hole temperatures measured by geophysical log surveys of wells drilled for oil, natural gas, and helium in the northeastern portion of the Colorado Plateau tectonic province of Arizona. It represents the first phase of a subsurface temperature project designed primarily for the use of earth scientists interested in the geothermal-energy potential of the state. The second phase of the project will present surface water temperature and associated data of numerous wells drilled for irrigation and other purposes located mostly in the Basin and Range tectonic province of Arizona. CONLEY, J.N., STACEY, O.A., 1977. Subsurface Temperature Maps State of Arizona. Oil and Gas Conservation Commission. 1997. Tucson, AZ. The following matrix summarizes the water quality data and related hydraulic data available for Pima County. The matrix is based on information that PAG obtained by mailing a questionnaire to various organizations, by conducting telephone interviews, and by browsing the internet. This matrix is only a summary; the information is presented in more detail in the following section of this report, along with brief descriptions of the agencies that collect water quality data. Make available basic ground water data that are useful in planning and studying water resources development. Maps and graphs. Drillers' logs. Chemical analyses. Roeske, R.H and Werrell, W.L. 1973. 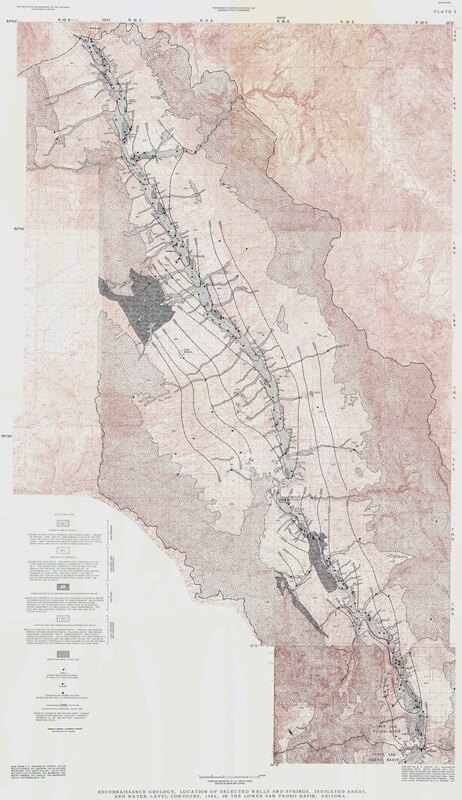 Hydrologic Conditions in the San Pedro River Valley, Arizona, 1971: Arizona Water Commission, Phoenix, Arizona Water Commission Bulletin 4, 76 pp. Reports a more detailed study of hydrologic and geologic data than is feasible in the annual report covering the entire state. Maps and graphs of water levels and changes. Drillers' logs, chemical analyses. White, Natalie D., Matlock, W.G. and Schwalen, H.C. 1966. An Appraisal of the Ground Water Resources of Avra and Altar Valleys, Pima County, Arizona: Arizona State Land Department, Phoenix, Water Resource Report 25, 66 pp. Heindle, L.A. and White, N.D. 1965. Hydrologic and Drill-Hole Data San Xavier Indian Reservation and Vicinity, Pima County, Arizona: Arizona State Land Department, Phoenix, Water Resource Report 20, 48 pp. Study to determine the feasibility of making predictions of the future effects of ground-water withdrawal with the data available. Maps. White, N.D., Stulik, R.S. and Rauh, C.L. 1964. Effects of Ground-Water withdrawal in Part of Central Arizona Projected to 1969: Arizona State Land Department, Phoenix, Water Resource Report 16, 25 pp. Lewis, Douglas D. 1963. Desert Floods - A Report on Southern Arizona Floods of September, 1962: Arizona State Land Department, Phoenix, Water Resource Report 13, 30 pp. Heindle, L.A. and Cosner, O.J. 1961. Hydrologic Data and Drillers' Logs, Papago Indian Reservation, Arizona: Arizona State Land Department, Tucson, Water Resource Report 9, 116 pp.